We're going to need some help on this one. 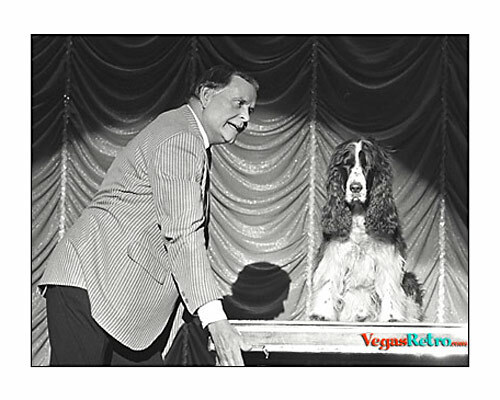 This funny, funny man/dog act appeared in the Folies Bergere at the Tropicana Hotel in 1973. Anyone know the name? Thank you all for your memories Bob & Louie were one of a kind! jus sat no matter what the command! Yep, Gig is right. The dog just sat there. "There's no Wires, nothing to hold him up"
I seem to remember that the dog got hit by a car. "Bob Williams and Louie the Dog" by: Sarah B. My favorite line from this act is, when Louie just sat there: "He's thinking about it, folks!"